What does Ub mean on an LG washer? On front loading and top load LG washer there are different reasons why the Ub error code can display on your washing machine. LG washer is getting the Ub error code? The Ub error code on the LG washing machine display is an indication of a TUB IMBALANCE or ITEMS NOT DISTRIBUTED PROPERLY issue. The 3 issues that may cause this fault code is a SMALL LOAD not distributed properly, SINGLE BULKY ITEMS sticking to one side of the drum, or LARGE ITEM uneven loads spreading across the surface of the drum. These WASH LOAD VARIABLES can cause your LG washer to display the error code Ub or UE. With these different reasons, redistributing the items will clear the error and fix your LG washing machine. If you have a front loading LG washer and the display shows the Ub or UE error, you will need to open the front loading door and redistribute the clothing or items within the drum. This needs to be done when the washer has ITEMS NOT DISTRIBUTED PROPERLY to clear the error code. Adding more items into the wash tub may be necessary to BALANCE the washer and clear the error code. If you have a top loading LG washer and the display shows the Ub or UE error, the washer will attempt to add more water and agitate to redistribute the weight. You may have to open the top lid and move the clothing or items around to clear the Ub or UE error. Adding more items into the tub may be necessary to BALANCE the washer and clear out the error code. NOTE: The UB error code on LG front loading washers can show during the washing cycle. This is to let you know the washing machine detected an OUT OF BALANCE LOAD and you will need to redistribute the items to rebalance. 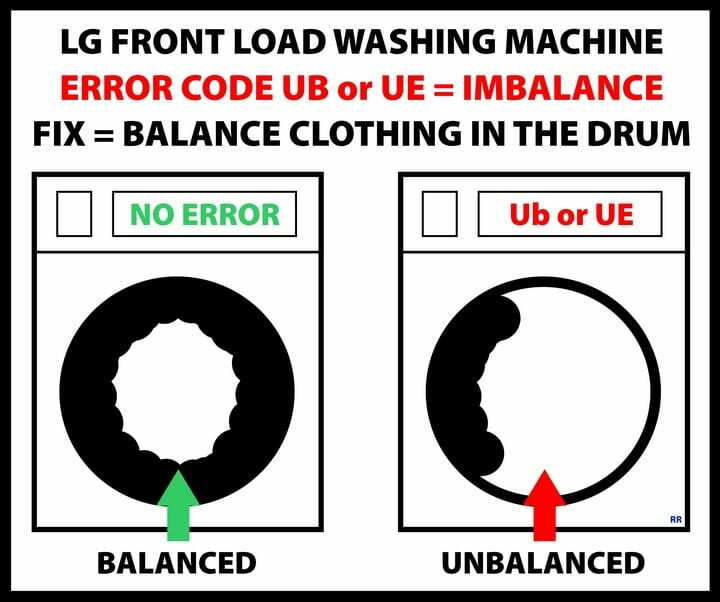 NOTE: The UB error code on LG top loading washers can show during the washing cycle. This is to let you know the washing machine detected an OUT OF BALANCE LOAD and is calculating to rebalance. Questions about the UE or Ub error code? Please leave your comment below including your LG washer model number. Previous post: GE Profile Dishwasher Shows Code 1h Will Not Start? Next post: Washing Machine Leaking Water From Bottom – How To Fix?